Willow Creek Olive Estate recently extended their range of flavoured olive oils and they sent me a bottle of the Persian Lime Olive Oil to try out. This award winning olive oil is so heady with lime that I am absolutely in love with it. Willow Creek recommend searing some tuna in this oil, but I wanted to think a little bit outside of the box and so I created a recipe for an olive oil ice cream using this flavour. The lime was so refreshing in the heat of summer, and despite the ice cream using olive oil as an ingredient it was not fatty at all. I have also marinaded some olives in the Persian Lime Olive Oil, together with some indigenous rosemary, garlic flowers and garlic cloves. Disclosure: I was sent the bottle of olive oil as a gift. All opinions and facts in this post are my own. I was not required to write a blog post in exchange for this gift. This post is in line with my blogging policy. I’m very interested in trying this! Thanks Tandy! What a delicious sounding olive oil, and such a great idea to make ice-cream with it. I will have to pull out my ice-cream maker. So interesting using olive oil in ice cream…the ice cream looks very rich and lime sounds absolutely delicious! This ice cream looks pretty wonderful! I’ve been wanting to make olive oil ice cream. I like that it’s lime flavored, too. I bet this has an amazing flavour – I had olive oil icecream once in a Greek restaurant, and was amazed at how delicious it was! Love your version of olive oil ice cream Tandy! We have been able to enjoy olive oil ice cream here in California, and your delicious recipe sounds so easy that we have to try some soon. Wow, that IS a great, unique use for the olive oil. Looks great. Amazing – I really want to try this with our own olive oil. 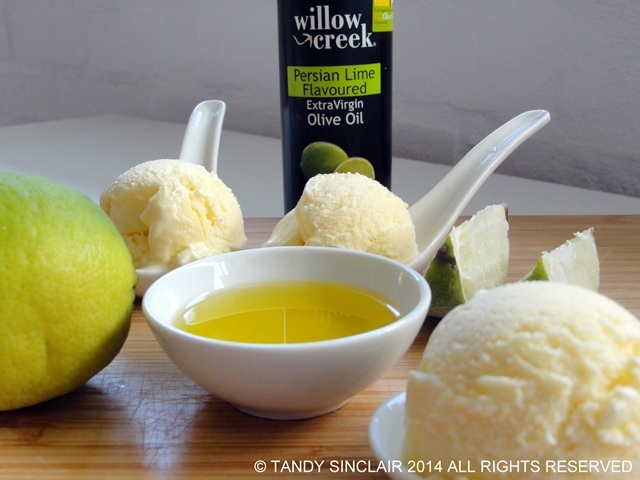 I had heard of olive oil ice creambut never eaten or made it – what a great idea! Thank you Uru, the oils was amazing! Hi Tandy, so creative and refreshing. After seeing something like this I need to really go out and buy the ice cream maker. What a beautiful idea and lovely recipe with few ingredients and the rich flavors of olive oil. I would love to taste your ice cream Tandy. Pop in for a visit any time Mandy! Never had a single oil infused ice cream before, i guess i’m gonna made this with avocado oil.. I love that you used a flavored olive oil for this! I’m sure the ice cream was a little “out there” but delicious! That’s a very clever way to use olive oil. Does it have a strong olivey taste? Or is it more limey?